We are working on novel wake-up receiver designs as well as low power wireless communication. This work couples the design of embedded systems with that of novel communication protocols. In this scope, we also research on reliable wireless communication using diversity techniques and fountain codes. The work is also a basis for next generation nano communication systems. Complementary, we also develop off-loading strategies as well as energy prediction models for the Android world. Distributed congestion control for wireless communication is the basis for soft real-time applications, particularly in the vehicular networking field. Our beaconing protocols are complemented by heterogeneous networking concepts particularly including visible light communication. On the hard real-time side, we design platooning control and intersection safety systems. 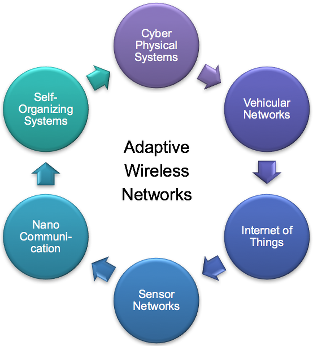 Besides vehicular networks, this work also covers industry automation solutions (wired and wireless) as well as research in the scope of the tactile Internet initiative. Our Veins simulator has become the de-facto standard in the vehicular networking research community and is based on validated models ranging from accurate signal propagation models to current protocol standards, and to realistic vehicle mobility. Recently, we extended the framework for covering LTE (VeinsLTE) as well as platooning control (PLEXE). Our roadmap continues to provide models for visible light communication. On the experimental side, we developed our own Linux-based field test devices for vehicular networking applications, as well as widely-used GNU radio based software defined radio solutions supporting protocol design and evaluation on the physical layer.